Castleton University is a Public, Non-Sectarian, Liberal Arts, College established in 1962. 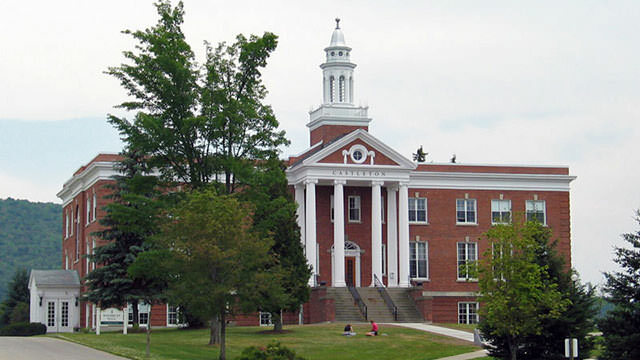 The campus is located in Castleton, Vermont, USA and hosts 2,215 (2010) students with an endowment of . Castleton is truly “the small university with a big heart”. I graduated in the Spring of 2017 with a B.S. in Biology. The science department, like other departments, was a close-knit group. The small classroom sizes allowed each student to get the individual attention they needed to succeed. At Castleton, you’re not just a number, you’re a person. Professors know your name, have conversations with you, and even go to sporting events to show their support. Castleton offers numerous majors, athletics, and clubs, making it appealing to those who want to do it all. I entered my Freshmen year undeclared but was able to find the right major for me through the guidance of advisors and professors. The campus is beautiful, reflecting a true Vermont experience and was well-kept throughout my entire career there. One of the most important aspects of Castleton is that it’s safe. I never felt uncomfortable walking to my dorm or to the parking lot. Castleton is truly “the small university with a big heart”. In my time at Castleton, I had the opportunity to be part of the Spartan family in many ways. I graduated in the Spring of 2017 with a B.S. in Biology. The science department, like other departments, was a close-knit group. The small classroom sizes allowed each student to get the individual attention they needed to succeed. At Castleton, you’re not just a number, you’re a person. Professors know your name, have conversations with you, and even go to sporting events to show their support. Castleton offers numerous majors, athletics, and clubs, making it appealing to those who want to do it all. I entered my Freshmen year undeclared but was able to find the right major for me through the guidance of advisors and professors. The campus is beautiful, reflecting a true Vermont experience and was well-kept throughout my entire career there. One of the most important aspects of Castleton is that it’s safe. I never felt uncomfortable walking to my dorm or to the parking lot. Castleton offered a great opportunity to focus on classes while also getting to explore nature. Professors were available all throughout the day if you needed help outside of class. There are lots of great opportunities to participate in research projects and network within your given field. There was always some type of activity or event going on around campus. I would highly recommend Castleton for any student looking to get hands on experience in their given field and to get a job after graduation. Castleton is located in a wonderful area in Vermont. Generally class sizes are small, which allows students to build relationships with their professors. Most professors are willing to help whenever and are even there to help guide you in next steps after undergraduate work. The Natural Sciences has had a large influence on my life. They were able to challenge me and guide me through the steps I needed to take to get into graduate school. They also gave me opportunities to become a leader and have a voice in this department. Overall I loved my time here and am proud to be a CU graduate! A beautiful campus located in central Vermont, this university perfectly combines the charm of small-town living with the ease of accessibility to more urban settings. The small student-faculty ratio allows you to get to know your professors and fellow classmates easily, and presents opportunities like undergraduate research. The Natural Sciences Department is close-knit, encouraging collaboration and personal growth throughout my undergraduate studies. I highly recommend CU to anyone looking for a top-knotch education in a beautiful area. Small campus and classes. Easy to get to know your classmates. Great sports programs with passionate trainers and coaches. Outstanding faculty that is personable and down to earth, especially in the science department. Would recommending for anyone. Castleton is home. During my time at Castleton I grew immensely as a scientist and as a human thanks to the support from faculty and staff. As a student, as soon as I showed a sufficient level of interest, the faculty expended great amounts of energy and time helping me to get a foot in the door for any class, scholarship, fellowship, or graduate program. They drove us places to do research, sacrificed weekends with their families to go on field trips and conferences. As a graduate student, I am most proud of the friendships that I formed there and incredible people that I get to call mentors and peers. Their hard work and dedication to teaching and forwarding science is contagious and influences students throughout their lives. Improvements: facilities are fairly old, there could be some more instrumentation. Footnote: the majority of my experiences are with Natural Sciences and the faculty of NAS, my experience is greatly reflective of that. Castleton is a beautiful school, set in small-town Vermont. It’s a great place for students who want to be seen as more than just a number. It’s easy to get to know your professors, and they are always willing to help with anything from schoolwork to networking. For such a small school there is a wide array of degree options offered, and tons of different classes available each semester. Castleton is a good fit for students who are focused on education and interested in outdoor activities such as hiking, swimming, and skiing. There is not a big party scene, and there are few restaurants/bars/shopping near campus. Overall a wonderful school with professors dedicated to the success of their students.